As expected after a Microsoft blog accidentally preannounced the date yesterday, the Release Preview of Windows 8 will be available today, in 14 different languages. This is the last pre-release before the Release to Manufacturing (RTM), which Microsoft expects to be at the end of July. However, there's still no date for general availability, which is when new PCs will be on sale running Windows 8. 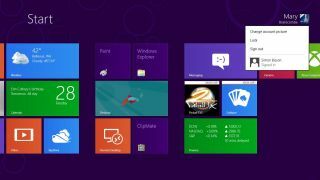 For now, Microsoft suggests people buy a Windows 7 PC and upgrade; the official Windows Upgrade Offer from new Windows 7 PCs to Windows 8 Pro starts on June 1 and runs until January 31 2013. More details, along with pricing for the upgrade in the U.K. (and the other 130 countries where it applies), will be announced on June 1, but the U.S. upgrade price will be $14.99. The "tens of thousands" of improvements made in response to feedback on the Consumer Preview are small updates and adjustments rather than major changes in direction. There are tweaks to the interface, in Explorer and elsewhere, but the Metro Start Screen is here to stay with no option to turn it off. Although the Start button isn't coming back, the Start screen thumbnail in the task switcher is clearer and there are more ways to personalize the Start screen, although that's more colours rather than being able to put your own images behind the tiles. There's improved support for working with multiple monitors, like being able to view and snap Metro apps on more than one screen. And, there are various "security improvements" including new Family Safety options. Some of the improvements Microsoft is highlighting are actually either new or updated Metro apps: Bing Travel, News and Sports apps and Gaming and Music Xbox apps that work with a Zune Pass join updated versions of the Mail, Photos and People apps in Consumer Preview. These matter not because they're the only Metro apps you'll get, but because they give a much more polished view of what Metro-style apps should look like. There are more third-party apps coming for the Windows Store, from commercial software developers and through the "30 to Launch" competitions that Microsoft is running to encourage newer developers to come up with Metro apps. As the store fills up, the new options for searching for interesting apps will get more useful. In Release Preview, Internet Explorer 10 picks up versions of two features you may recognize from other browsers, but made simpler for mainstream users. Rather like Chrome, IE 10 will pre-load some pages as you visit Web sites, so when you swipe forward on the first page of a story broken into multiple pages, the next page will open right away. Microsoft calls this Flip-Ahead and talks about it as a touch feature. And, in addition to the Tracking Protection Lists, you can turn on in IE 9 to block specific third-party tracking cookies and services, IE 10 turns on the Do Not Track setting proposed by Mozilla (and used by a handful of sites including Twitter). DNT is an option in IE 9 as well, but IE 10 is the first browser to have it on by default. IE 10 also gets the rumoured built-in Flash player for a Microsoft-approved list of sites, even in Metro IE. That means sites like YouTube that expect IE to have Flash and so don't show it HTML5 videos will now work correctly, instead of prompting you to switch to desktop IE 10. That's in the Windows 8 version of Internet Explorer, but Microsoft confirmed to TechRadar that Windows RT users won't be left out. "The Flash Player in Metro style IE for the Windows 8 Release Preview is for X86/64-based architectures. However, Adobe and Microsoft are also committed to providing the same integrated Flash Player support on the initial delivery of Windows RT PCs (Windows running on ARM processors)."